The Savaria SL-1000 stairlift works on straight stairs to glide up and down in comfort and safety using the onboard controls or with the help of remote control operation, providing barrier-free access in your home or business. 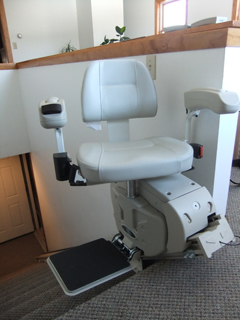 With its extra comfortable seat, adjustable width arms and high weight capacity, this stairlift is feature-packed. The constant-charge battery operation means that your stairlift works even through a power failure giving you peace of mind. The Savaria SL-1000 installs quickly and easily, and its onboard diagnostic display alerts you of any service issues. If you want an affordable, reliable, and easy to use lift, the SL1000 is just right for you! Master shut off can be turned off if not used for an extended amount of time: Money saving option for electricity and battery life. Obstacle sensors: Stops the chair if it meets and obstruction for safe operation.